A touching gift book that helps readers understand the power and beauty of prayer and how it can transform our hearts, so that we can be a catalyst for transformation in others. Many of us seek to be blessed more than we seek to bless others. It's our heart aligned with the heart of God that brings blessing. It is part of who God is, perhaps the biggest part, because He is by nature extravagantly generous and loves giving gifts. No matter where readers are on their journey with God, they will be motivated and inspired to open their hearts and discover the abundant joy and peace that can be theirs through the power of a simple prayer of blessing. 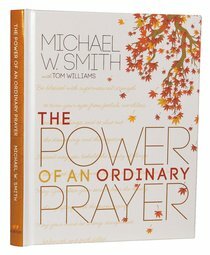 About "The Power of An Ordinary Prayer"
the power of a simple prayer of blessing.